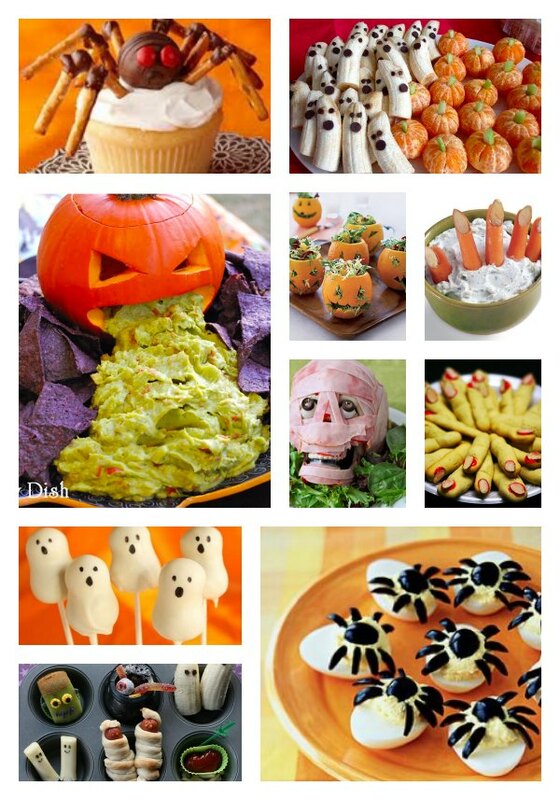 Halloween is right around the corner and it’s time to start thinking about the Halloween food ideas needed for that special Halloween party. Coming up with clever ghost and goblin foods can take some planning. Halloween takes tons of planning. Planning on what to wear for your costume. Planning the kids costumes. Planning for the food. Oh, and planning to take all the kids trick or treating at the same time safely. Speaking of safety. Don’t forget the flashlights or glow sticks. Ordering those ahead of time can save you money. I was able to grab a pack of 100 glow sticks on Amazon for under $10! See… the planning doesn’t seem to stop! If you are looking for Halloween Decorations, Costume Ideas and FREE Halloween Pumpkin Carving Templates, head over here! One of my absolute favorite party snack ideas last year was the “funny bones” Halloween snacks. They are made from pretzels, marshmallows and white chocolate. They are super easy to make and the kids loved them! Read the full tutorial here. I tell you the best presentation goes to the pumpkin on the table that looks like it’s spewing everywhere with guacamole dip. The adults got a kick outta that one. But, the overall favorite loved by all is the shortbread cookies that look like witch fingers when you add an almond sliver to the tip for the fingernail. One of the best cookie recipes I’ve ever tried is this one here. These are one of the only cookie recipes that I’ve ever tried that really hold any shape you make out of them. Perfect for this type of project! It looks so real it’s scary! They taste delicious too. The easiest to make Halloween foods to make was the spider deviled eggs. I grabbed this deviled eggs recipe here (minus the crispy bacon on top). I added the black olives sliced in half for the body, then sliced the remaining half for the legs. So easy! The ghostly marshmallow pops were just as easy. I found a clever marshmallow pop tutorial here that helped teach me how to make them. After I made them I added some black ghost faces on each one. They came out so cute! The little kids had a blast with these! They were pretty easy to make ahead of time too. I made them a week ahead of time. To preserve the freshness I placed a small baggie around them and tied it with a twisty to seal in the freshness. Worked like a charm! 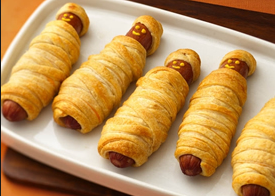 The most filling Halloween party food was the mummy hot dogs! You can make them with sausages too! All you have to do is cut strings of crescent rolls and roll then around a hotdog or sausage, then bake. Most of the Halloween snack ideas are sweets so this was a nice change. And last but not least, we ended up decorating our Halloween party with this giant spider decoration (seen here) that hung above right about the kitchen table where all the food sat. It gave our party the final decorating touch we needed!